This tool will help determine possible causes and solutions of typical water quality issues experienced in a home. Please contact Customer Service at 502.583.6610 to request support of Water Quality staff if this process does not address the issue. Does it occur with just the cold water, the hot water, or both? Does the problem occur in every faucet? Does it occur only when you first turn on the water or does it occur continuously? Are your neighbors experiencing the same problem? Do you know what type of pipes you have in your home (i.e., copper, galvanized iron)? Do you have any home treatment devices (i.e., water softener, reverse osmosis system, whole house filtration system or point-of-use activated carbon filter)? See it? Smell it? Taste it? Cloudy, Foamy, or Milky Water? Brown or Yellow Cold Water? If you are experiencing cloudiness in the cold water, hot water or both hot and cold water the cloudiness is caused by tiny air bubbles. When water temperatures are cold (<50ᵒF) extra oxygen molecules are readily accepted by the water molecule (H2O). The water and air is then held under pressure in your water pipes, much like a bottle of soda. When you turn on your tap, the pressure is released, allowing the bubbles to appear, just as removing the cap from a soda bottle causes the soda to fizz. If you allow a glass of water to stand for a few moments, the cloudiness will begin to clear at the bottom and rise to the top. This phenomenon is called entrained air and does not affect the quality of your water. The water is perfectly safe to drink. This could indicate an internal plumbing problem of your house. Many houses have galvanized iron pipe or galvanized fixtures, when the zinc coating on the inside wears thin, the water comes in contact with bare iron causing it to become discolored. The longer the water stays static in the pipes, the more the discolored it will become. That is why this problem is usually noticeable the first time you turn on the tap in the morning. Flush the line for a minute or so and the water should become clear. Iron poses no health risk when consumed. Iron is an essential nutrient and is only considered an aesthetic issue. 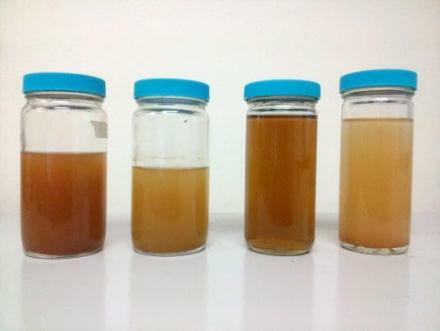 Light yellow to dark reddish brown water is typically caused by a disturbance of pipeline sediments in the water main. The discoloration is caused by dissolved iron which is stirred up in naturally-occurring sediments that exist in all water systems. The discolored water may be due to planned cleaning of the water main to remove pipeline sediments in your area. Entities such as Fire Departments opening or closing of a water hydrant for pressure testing located near your home may stir sediment. Pipeline repair work (or construction activity) in the area can also contribute. Iron is an aesthetic issue and is not an indicator that the water is unsafe or that the integrity of the water main has been compromised. A disinfectant residual is maintained at all times to ensure that the water is safe for household use, including cooking and drinking. If you experience this type of discolored water take precautions to clear the lines to your laundry facility to prevent articles of clothing from becoming stained. Please call Customer Service at 502-583-6610 to report any discoloration that has not cleared within a few hours. When water appears gray or black it is typically caused by a disturbance of sediment in the pipeline. The discoloration is caused by presence of manganese. 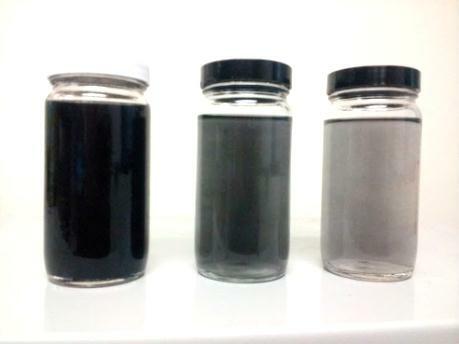 Manganese is naturally occurring sediment and is an aesthetic issue. The presence of manganese sediment is not an indicator that the water is unsafe or that the integrity of the water main has been compromised. A disinfectant residual is maintained at all times to ensure that the water is safe for household use, including cooking and drinking. If you experience this type of discolored water take precautions to clear the lines to your laundry facility to prevent articles of clothing from becoming stained. Please call Customer Service at 502-583-6610 to report any –discoloration lasting longer than 24 hours with internal flushing or clears but returns every few days. (see internal flushing tips below). Having blue water is very uncommon and is usually the result of just a couple of things. If your water supply was recently turned off, a condition may have been created in which water from the toilet tank was siphoned back into the plumbing of your house. The blue disinfectant you use in your toilet can cause discoloration of your tap water. These disinfectants contain chemicals that may pose health hazards if ingested or touched. Flush your plumbing by opening each tap until the water runs clear. Do not drink this water. Please call Customer Service immediately at 502.583.6610 to report this issue. 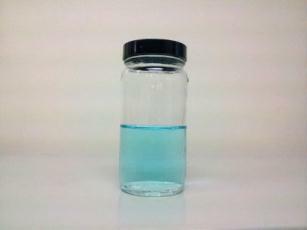 Blue water can also be an indicator of copper corrosion. This is most common in establishments that have soda fountains. If you have soda fountains with carbonation and are experiencing blue water, blue ice or if customers are describing bitter tasting water or upset stomachs in your establishment, shut down the soda fountains immediately and contact your beverage supplier. Please call Customer Service immediately at 502.583.6610 to report this issue. Pinkish orange stains that develop where water stands, such as shower floors, pet dishes, in the toilet bowl along the water line and at the bottom of a shower curtain. This is caused by a bacterium that is air borne but grows in wet areas such as those listed above. Although not proven to be harmful it is a bacterium and should be removed. This can be done by cleaning the area with a commercial cleaning product that contains bleach. If the particles are very hard, similar in size and shape, and look like large coffee grounds, they are probably granular activated carbon (GAC) particles from the inside of a GAC water filter that you have installed. Replace the filter cartridge or consult with the manufacturer or the vendor who sold it to you. If the particles are solid but rubbery in texture, they could be pieces of an old disintegrating faucet washer or gasket. If this is the problem, the particles would likely only be present at one faucet and that faucet is already leaking. Replace the faucet washers and the packing at the ends of the supply lines. 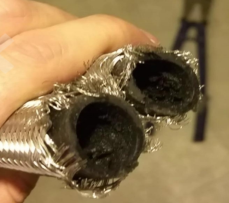 If the particles are small black particles that can be easily smeared between two fingers, or have a tar like consistency, they are probably from the inside of a flexible hose connected to the water heater. These black rubber hoses are covered with a braided stainless steel mesh. 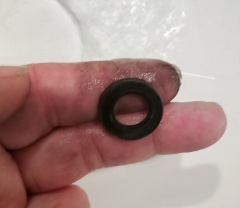 Over time, the chloramine in the water causes the rubber to break down. The flexible line will need to be replaced; we recommend that you contact a licensed plumber to assure that all fixtures meet local plumbing codes. 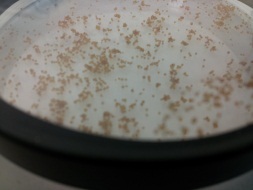 Brown or orange particles can be rust particles that have broken off the inside of your water pipes or the water mains. These particles are very hard, irregular in size and shape, and can be several different colors (including black). This type of sediment is an aesthetic issue and not considered a health hazard. Another common cause of brown or orange particles in the water is a malfunctioning water softener. The particles will be uniform in size, typically the size of fish eggs, and are brown or orange and feel spherical if rubbed between your fingers. The microbeads are contained within the softening unit by a thin membrane that over time can break, releasing millions of these microbeads into your water lines. If you can locate the by-pass valve of your softener you can temporarily resolve the issue until you can call your service agent for repairs. If the device is not in use you will want to make sure there is no hook up to your internal plumbing, even if the device is unplugged it can affect your water quality. White or tan particles in the water usually come from internal plumbing. This material is pipe scale and is a combination of calcium carbonate and magnesium carbonate. Calcium and magnesium carbonates are naturally occurring minerals and are not a health hazard. The water heater is another source for white or tan particles. As the water is heated, calcium and magnesium carbonates can precipitate out of the water, forming white or tan sand-like deposits. As you use the hot water, these minerals can be carried along. To keep mineral deposits from accumulating in the water heater, follow the manufacturer’s maintenance instructions of your water heater. If the white particles are clogging the aerators of faucets, shower heads and appliances they could also becoming from the water heater. A water heater contains a plastic dip tube that takes the cold incoming water to the bottom of the tank. As the tube ages, it can disintegrate, sending white particles throughout the hot water lines. These particles are brittle and vary in size and shape. They can look like chips, shards or even plastic strips. Contact the manufacturer of your water heater for more information on your particular model. The model and serial numbers are found on the manufacturer’s label stuck to the outside of the water heater tank. The scale or sediment left behind on fixtures, white surfaces, and pots after water evaporates are calcium and magnesium carbonates. These are naturally occurring minerals and do not pose a health hazard. These deposits may appear green, blue, or brown, having been colored by tiny amounts of the metals found in your water pipes or fixtures. 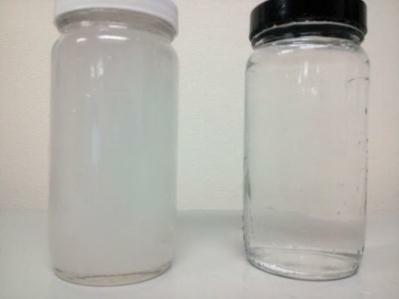 Carbonate deposits can be dissolved with white vinegar. Dishwasher deposits can be minimized by using a commercial conditioner, by using liquid detergents and by using the air-dry instead of the power-dry setting on your dishwasher. Always refer to the manufacturers recommendations before using commercial products to your appliance. Start by flushing the cold water faucet in the bathtub for five minutes. 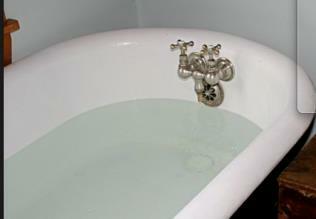 After the tub faucet runs clear, flush all of the other cold water household faucets. If discolored water has been drawn into the hot water system, it may continue to be discolored until the discoloration has either been flushed out by use or settled. If you experience yellow, brown or red water for more than 24 hours please call Customer Service at 502.583.6610. Smell and taste are categorized together since those two senses are dependent upon the other for accurate characterization of an issue. The first step is to determine if the problem exists in the public water supply or in your plumbing. If the water supply is causing the odor, you will experience the odor at every water faucet and it will not fade as the water runs. It will also be present on the cold water. If the source of the odor is in your plumbing, most commonly the drains, you will experience the odor in only one or several, but not all, of the faucets. If the problem goes away after running the water for a few minutes, the cause is somewhere in your plumbing. When you detect an odor in your tap water, we ask that you perform what we call a glass test at the faucet where you first noticed the odor. Run the cold water tap for 20 to 30 seconds. Fill and rinse twice with cold tap water. Fill the glass and turn off the faucet. Step away from the sink (this eliminates the possibility of mistaking odors from your drain for odors in your water). Smell the water in the glass and characterize the odor, if any. Please see the descriptions below to characterize the odor you are detecting. If the odor is medicinal, it is most likely the chloramine (also called total chlorine) that Louisville Water uses to disinfect the water to ensure that it is safe to drink. Although the total chlorine level is a fraction of what is found in pools and spas, you may occasionally detect the smell of chlorine in your water. This odor may be particularly strong in the shower since chlorine is released to the air more rapidly when mixed with hot water. If the odor is a sulfur/rotten egg or sewerage smell that you only smell at the sink and not in the glass you can easily remedy this by applying a small amount of bleach into the drain trap at bedtime and let it stand through the night. Do not run the water until morning to give the bleach time to kill the bacteria (the cause for this odor) in the drain. This may take more than one application. Cold Water: If the odor is coming from the water in the glass please call Customer Service at 502.583.6610 to report the issue. Hot Water: If you find these odors in your hot water only we recommend that you contact a licensed plumber. These odors may be caused by an algae bloom in the Ohio River. It can be exacerbated by living on a dead end main like found in some cul-de-sacs. If you believe that you live on a dead end main please call Customer Service at 502.583.6610 to report the issue. If you smell gasoline or an organic solvent odor in the cold water, call Customer Service immediately at 502.583.6610 to report this issue. This problem is rare and potentially serious. Refrain from using the water until speaking with a Water Quality Specialist. If you detect and odor characteristic of plastics/latex or chalk and you are located in a project zone where new water mains are being installed, please call Customer Service at 502.583.6610 to report the issue. If you haven’t found a description of the issue you are experiencing please report the issue to Customer Service at 502.583.6610. Handling Water Quality Complaints. California Nevada Section, American Water Works Association. Third edition. 2007.